Dogs are generally full of energy and curiosity. Their bodies are designed to be active, the reason why house dogs such as poodles still yearn for a taste of the outside world even if this only means a short play in the backyard. Inside the comforts of home, our dogs still find ways to unleash their energy by jumping, running, and tearing things to pieces from time to time. These tendencies make their paws dirty and because bacteria can thrive in the folds of a paw, washing with plain water is not enough. You need a specially-formulated paw washer. But hold on because not all paw washers are created equal. Some are strong, while others are mild and sweet-smelling. Some are laden with chemical ingredients and a few others are advertised as natural. Of course, knowing your dog’s physical activities help determine the intensity of the product. But more than that, you also need to observe and check with your veterinarian the possible allergens that can cause adverse skin reactions. Say goodbye to muddy and dirty floors whenever your pet comes home after frolicking in your backyard with the Dexas Petware MudBuster dog paw cleaner. 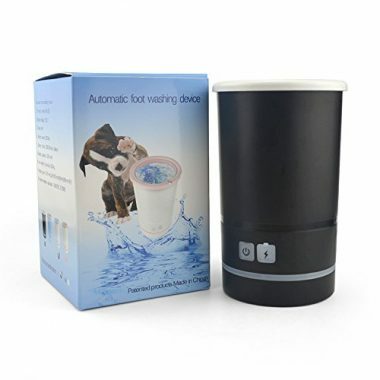 This patent-pending dog paw washer comes with a very simple tumbler-like design that accommodates a cleaning mechanism to get rid of the dirt and muck that may have stuck in your dog’s paws. The cleaning mechanism is composed of several layers of gentle and soft silicone bristles that effectively remove dirt and other particles off of your pet’s paws. There are no complicated operations. It is as easy as putting one of your dog’s paws inside the cleaning hole, turn the tumbler a bit, and voila! You’ve got one neat-looking paw. Now, repeat the same process for the other 3 paws and you’re done. No wonder folks think of the MudBuster as one of the best dog paw washers. 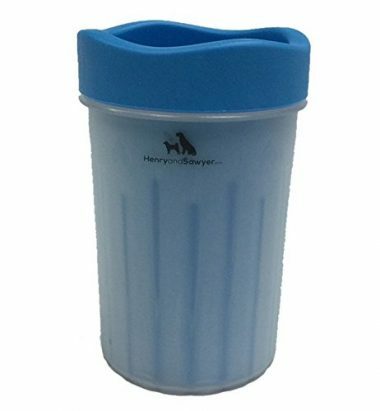 Most paw cleaner contraptions in the market come in cylindrical or tumbler form. We said ‘most’ because the Paw Plunger is definitely one of a kind. 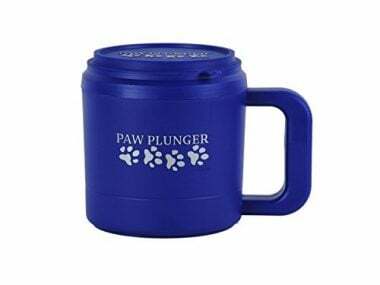 Taking the form of an ordinary coffee mug complete with a wide cup and a thick and handy handle, the Paw Plunger dog foot washer is a great gift for pet lovers everywhere but most especially to those who have a knack for the unusual. But the function of this dog foot cleaner is anything but unusual. The soft silicone brush pad that coils inside the ‘mug’ can be easily removed for easier cleaning. The top of the Paw Plunger is also designed in such a way that water will not be spilled outside. 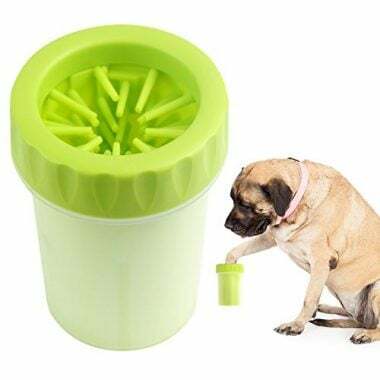 Plus, it comes with a nifty lid so you can bet that the inside of the Paw Plunger remains relatively clean until the next time your dog dips its paws into it. A lot of folks think that the Paw Boss is an automatic dog paw cleaner. No, it’s not. Unlike paw washing cups, the Paw Boss comes with a rectangular box design complete with a large hole and two smaller holes on opposite sides of the device. One hole is for filling the contraption with clean water while the other is for draining used, dirty water. There’s a section where you can also place liquid antibacterial soap to ensure hygienic and clean paws. The larger hole is obviously where you insert your pet’s paw to get cleaned. It can accommodate dog paws up to 3.5 inches in diameter so you’d better measure your pet’s paws first before getting the Paw Boss as it doesn’t come in different sizes. For its nifty features, it’s amazing to see that the Paw Boss still comes at a friendly price. The Petcabe dog paw cleaner is a fully automatic dog paw washer that makes quick work of any paw-washing and cleaning chores. There’s no need to manually twist or turn the canister just to move the silicone brush inside. A powerful-enough motor rotates the brush around your pet’s paws to ensure clean paws. The sleek elegant design of the ABS material-constructed casing also gives it a more stylish appearance than other paw washers in the market. And since it comes with a fully rechargeable battery, you can easily bring it anywhere so you can clean your pet’s paws before you let it into your car. And in case you don’t like what you see, you can always ask for a refund. Despite some issues of the Petcabe not working at all, it still is a great device to keep your dog’s paws clean without hassle on your part. 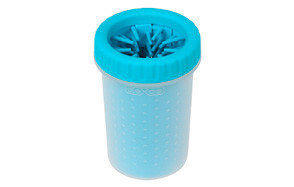 Paw Legend’s dog paw cleaner is an easy-to-use, easy-to-clean tumbler-like contraption with a screw-on lid and fully integrated brush bristles made of soft and gentle silicone. The integrated strap allows for easier and more portable carriage as you can conveniently slip it on your hands. It only comes in 2 sizes, though, and the green, pink, and blue colors may not appeal to everyone. Still, the Paw Legend makes its way as one of the best dog paw washers especially if you’re looking for something that fits right in your budget. The materials used in the construction of the Paw Legend dog paw washer are guaranteed to be safe for your dog so there should be no worries every time your hound dips its paws into the device. 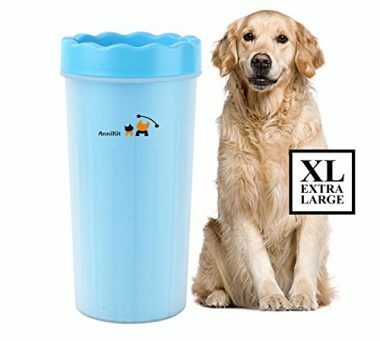 AnniKit’s paw cleaner follows the same conventional design of dog paw cleaning cups, although it makes sure that there’s plenty of space to allow dirt and other particles to fall into. It only comes in a single size that should be good enough for large dog breeds like German Shepherds, Alaskan Malamutes, and even Dalmatians. Like the rest of the dog foot cleaner products we’ve seen in the market that are designed as cleaning cups, the AnniKit comes with soft and gentle silicone bristles that can also be easily removed for hassle-free cleaning. You’ll never have to worry about dirty floors and muddy carpets ever again, although we sure wished AnniKit also included a handy strap for the dog paw washer. It may have the same design as the other tumbler-like dog paw cleaners in this list, but the Henry & Sawyer Dog Paw Cleaner is surprisingly well-loved by those who have already tried it. Compared to other products in the market, the H&S has a more durable construction and more effective cleaning capabilities than those that technically have the same design. It also has silicone bristles so it really is quite mind-boggling the difference it produces when it comes to removing dirt and other particles from your dog’s paws. If you believe in the experiences of others, then the Henry & Sawyer paw cleaner should always be included in your shortlist. You don’t have to put up with twisting and turning a dog paw cleaner when all you really need to do is to push a button and your dog’s paws will already be sparkling clean. That’s what the TOPPLE automatic dog paw washer affords you. It is powered by a copper motor to automatically rotate the silicone bristles and get rid of mud, dirt, and other particles stuck on your pet’s paws forever. You don’t even need to worry about plugging the TOPPLE every time your dog uses it since it already comes with a 2000mAh rechargeable battery that’s good for 4 hours. It still follows the same design of a dog paw cleaning cup, however. It may have a very ingenious solution integrating a variety of technologies, the TOPPLE dog foot cleaner is still able to retain its affordability. Now that’s a great value. Clearly one of the best dog paw washers in the market is the Paw Perfect paw clear that already comes with a microfiber towel to help you wipe dog’s paws dry right after washing in the device. The removable lid allows for easier removal of the silicone brush to have it cleaner while the nifty hand strap sure can provide for more convenient handling. When it comes to portability, nothing can be as portable as one that can easily be attached to any hook or strapped onto your wrist. Perhaps the only lament that we have about the Paw Perfect dog paw cleaner is that you’re not given any choice for the design or at least the color. You’re given 2 sizes to choose from, however. 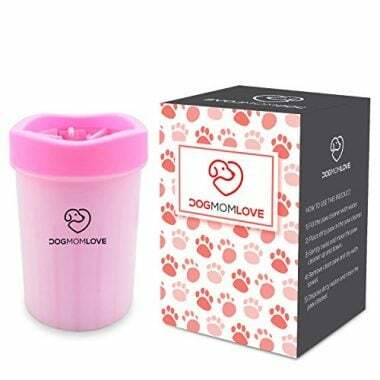 Available in blue, green, and pink, the DOGMOM LOVE Portable Dog Paw Cleaner is just like any other paw cleaning cup we’ve featured in this list except that it is priced slightly lower. Soft silicone bristles protrude towards the center of the tumbler-like device allowing for easier removal of dirt from your pet’s paws. Pet parents love because of the way the bristles are arranged, making sure that no surface on your dog’s paws is not cleaned with every turn or twist made on its ABS plastic body. While there are only 2 sizes to choose from, at least you’ll have something that works for your large breed dog. We’re not just sure if it can accommodate giants, although it does say the diameter of its large-sized dog foot cleaner is 4 inches. More and more pet parents are looking for more innovative ways to make sure that their pets won’t be licking or biting on their dirty, mud-covered paws. More importantly, they don’t want their pets to bring these unwanted particles into their homes or even their cars. The good news is that pet care manufacturers are also continuously trying to look for solutions to these needs of pet parents. And one of the niftiest solutions is a dog paw washer. But how do you pick the right one? Here is a list of the things you can look for. The main purpose of a dog paw washer is to clean your pet’s paws. As such, one of the things you have to look for is the cleaning mechanism. There are products that use brushes with silicone as bristles. These are deemed a lot safer for pets since they are not really rigid so as to cause irritation or even hurt your pet. There are also others that employ other cleaning mechanisms such as a cleaning cloth that can be rubbed against the paws of the dog. There are also contraptions that allow for the addition of liquid soaps, disinfectants, and other solutions to make the cleaning more efficient. You’ll have to decide which of these you think will work best on the kind of dirt that your dog usually brings home. Determining the kind of cleaning mechanism is one thing. Knowing if it is effective is another. Sadly, you cannot test every single product that you want to buy before you purchase it. So, you may have to read individual customer reviews to get an idea if the product you want to buy is effective in removing dog paw dirt or not. Remember that many of these products come with similar designs yet the experiences of actual pet parents often reveal that some products are more effective than others. This has something to do with the type of dog paw washer that you may want to purchase. 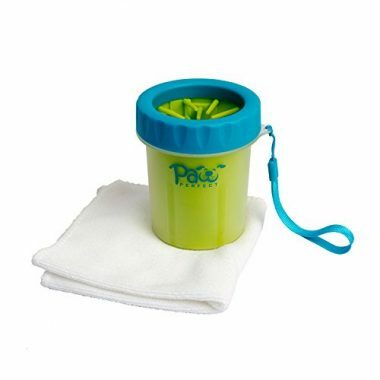 Manually operated dog paw cleaners known as paw cleaning cups require the manual twisting or rotation of the ‘cup’ to remove the debris, particles, and dirt from the paws of the dog. The operation is pretty straightforward since it is just like twisting a tumbler to remove its lid. There are also automatic dog paw washers that operate the cleaning mechanism with a simple press of a button. It’s what you can call effortless operation. All devices need to be cleaned and maintained so that you can ensure proper functioning at all times. The good news is that many of today’s dog paw washers are very easy to clean as the cleaning mechanism can be easily removed from their casing allowing for more thorough cleaning. The same cannot be generally said about automatics, however. Since these come with electronic components care must be taken when disassembling the device to clean the different components, otherwise, you risk damaging the cleaning device. As you may have noticed in our list there are a number of dog paw washers that technically have the same design from the canister right down to the use of silicone brush yet they differ in their price. Others offer a 100% money back guarantee while some will give you a limited 90-day guarantee. The point is you will have to study carefully your options so you can choose the product that can give you the best value for every cent you’re going to spend. Of course, you’d have to account for the quality of the product as well. You can use a puppy paw cleaner to keep your pup’s paws clean. If you don’t like such contraptions or you cannot find a device that is small enough to accommodate the diminutive diameter of your puppy’s paws, then you may want to look for other alternatives. For example, paw wipes are perfect for puppies since they can still feel your hands cleaning their paws. This is unlike paw cleaners that can give a rather unpleasant, if not odd, feeling to your young dog. Many paw wipes also have antibacterial and antifungal properties and can leave a nice scent on your puppy’s paws. If paw wipes are not your thing, you may want to consider using a chamois that is designed specifically for dogs. These are made of super-absorbent fabric materials that should easily wipe off dirt, debris, and other particles from your pet’s paws. These will also not startle your young dog as you wipe its paws clean. Sadly, you’ll have to contend with more laundry. Ideally, you should always clean your puppy’s paws right after coming from outside the house. This is to make sure that they will not carry dirt and other particles into your home. More importantly, they will not have something to lick on or bite that can endanger their health. There are two fundamental types of dog paw washers, although the principle of their operation is essentially the same. Manual or paw cleaning cups require the manual twisting or turning of the cup to rotate the cleaning brush inside. It is by turning the cup that the brush bristles move and remove dirt from your dog’s paws. Automatic dog paw washers, on the other hand, are operated by a motor that turns the cleaning mechanism. All you need is to press the power button and the machine will do the rest. A: These are devices that are designed to clean the dog’s paws. These devices can be either manually-operated or fully automatic. Manually-operated dog paw washers are known as dog paw washing cups. The ‘cup’ is filled with water, the dog’s paw is placed into the cup, and the cup is rotated to clean the paws. Inside the cub is a brush that removes dirt from the paw as the cup is turned. 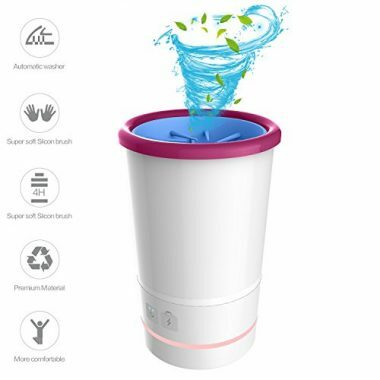 Automatic dog paw washers are basically the same, except that the rotation or movement of the brush inside the ‘cup’ or washing device is run by a motor. Q: How does a dog paw washer work? A: Imagine a tube with brush bristles on the inner wall. These brush bristles are oriented towards the center or middle of the tube. When a dog’s paw is inserted through the tube it scrapes against the bristles of the brush. When the tube is rotated, twisted, or turned, the bristles move as well. This movement of the bristles is what can remove dirt, debris, mud, snow, stones, small rocks, and other particles that may be present on your dog’s paws. This is the very basic principle behind the action of dog paw washers. Now, they call it washers because the tube is open on one end and closed on the other. This is to allow the tube to be filled with water which can help loosen the dirt or other particles present in the dog’s paws. It’s like the agitator in your washing machine. As it spins, dirt is eventually removed from your clothes. The same is true with a dog paw washer. By inserting the paw into the tube, bristles touch the paw. As soon as the bristles are moved, they also brush against the paw and remove the particles. Since there is water in the tube, the particles are washed off and allowed to settle at the bottom of the tube. This allows for easier disposal while also preventing the attachment of these same particles back into your pet’s paws. 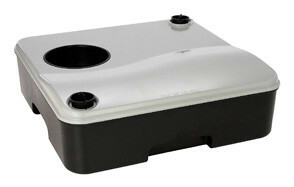 Whether it is manual or automatic, dog paw washers employ the same principle. It is through the brushing motion of the bristles that will remove particles off the paws. Q: How do I clean my dog paw washer? 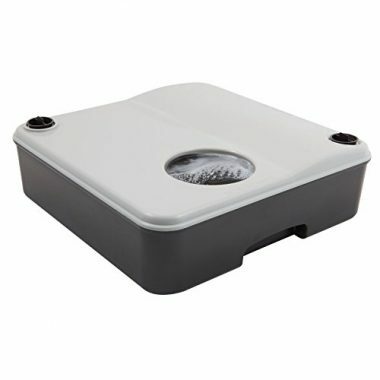 A: Most dog paw washers today, especially cleaning cups, come with a removable screw-on lid. It’s like a tumbler or a coffee travel mug that comes with a lid. Since the cleaning mechanism is located inside the ‘cup’, this can be easily removed by removing the lid and scooping the cleaning brush. The brush system of most dog paw washers is made of silicone since it is soft and gentle on your pet’s paws. Try to think of it as the rotating brushes on a car wash and you’ll know what we mean. It’s not rigid, yet it is fully capable of removing dirt simply because of its rotational motion. Once the silicone brush has been removed, you can easily wash this with warm soapy water or as directed by the manufacturer. We do insist on reading the owner’s manual since it contains a lot of information on the proper care, including the right way to clean, such devices. If you happen to have an automatic dog paw washer it is imperative to read the manual first. Usually, these come with a mechanism that allows you to remove the brush system. Be careful not to wet the device especially near its battery compartment. It is often best to remove the battery before cleaning your automatic dog paw washer. If the battery cannot be removed, then you should refer to the manual on how best to keep your dog paw washer clean. 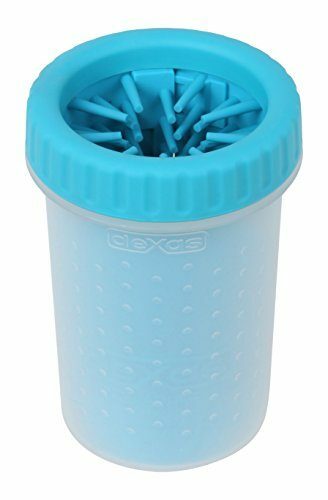 The Dexas Petware MudBuster Portable Dog Paw Cleaner is our top choice for the best dog paw washers. It has a very simple design yet when it comes to functionality it works like a charm. It is priced just right and comes with an easy-to-operate and easy-to-maintain design. The silicone bristles won’t hurt your dog while the textured body of the MudBuster makes it exceptionally easy to turn the canister and clean your dog’s paws. Cleaning your dog’s paws is important as you don’t want them licking or biting onto their paws that may already be covered with harmful germs. Also, you don’t want to keep on cleaning your house every time they venture outside. A dog paw washer should be your best buddy in keeping your pet’s paws clean.